In Riga (Latvia), Chairman of RT Stat Council, Chairman of the Coordination Council for the Affairs of Compatriots Farid Mukhametshin opened the first European Sabantui. This is a significant event for the first time in the history of the festival brought together many representatives of the Tatar and Bashkir communities in Europe. Compatriots from 11 countries: Sweden, Poland, Hungary, Germany, Belgium, the Czech Republic, Estonia, and others, took part in Sabantui IA Tatar-Inform reported. 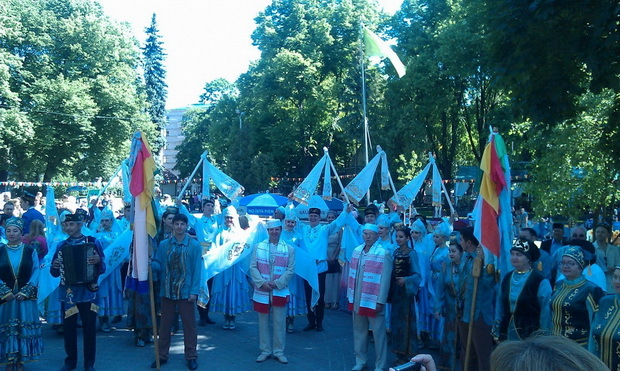 In the heart of Riga – Vermanes garden – a “City of Masters” unfolded, it was represented by the Tatar national souvenirs. Arena to fight kuresh gathered wrestlers, who had to figure out – who is the strongest. Other traditional Sabantui contests also were held. Those willing could taste national dishes of Tatars: chak-chak, echpochmak, belish, talkysh kaleve. 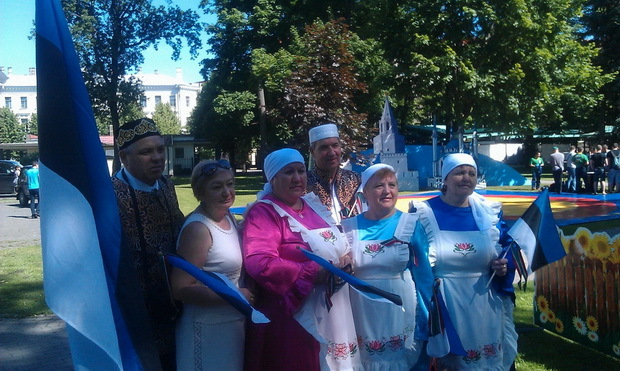 On the central stage of Sabantui – Maidan – Tatars of Europe were greeted by Chairman of Riga City Council, Riga Mayor Nil Ushakov. He stressed that this year Riga is not only the cultural capital of Europe, but also international a platform of national holiday Sabantui. He expressed the hope that the holding European Plow Festival would become a tradition. Holiday greetings to the participants were given also by the President of Latvia Andris Berzins. The representatives of the Tatar community, who came to Sabantui and Latvians, who came to meet national traditions of Tatars, head of Tatrstan parliament Farid Mukhametshin addressed. “Greetings to you, dear compatriots – Tatars, Bashkirs – who came not only from the Baltic countries, but also from several other European countries, this inherited from their fathers and grandfathers ancient holiday Sabantui! Today it is celebrated not only in Kazan, but in the 60 subjects of the Russian Federation and more than 25 countries, densely populated by our compatriots – Tatars “, – he said. Chairman of RT State Council expressed its appreciation to the mayor of Riga Nil Ushakov and Ambassador Extraordinary and Plenipotentiary of Russia to Latvia Alexander Veshnyakov for supporting the initiative for the Tatar community in the European capital of this ancient feast and passed to all Sabantui participants welcome form President of the Republic of Tatarstan Rustam Minnikhanov. Farid Mukhametshin presented lettersfrom RT President to the most active representatives of the Tatar community in Latvia – chairman of the Tatar-Bashkir cultural society “Chishme” Zufar Zainullin, deputy chairman of the society Ildus Sabitov and leader of the ensemble “Chishme” Fauzia Bulusheva. the People’s Artist of the Republic of Tatartsan and Renat Ibragimov and the RT State Song and Dance Ensemble. 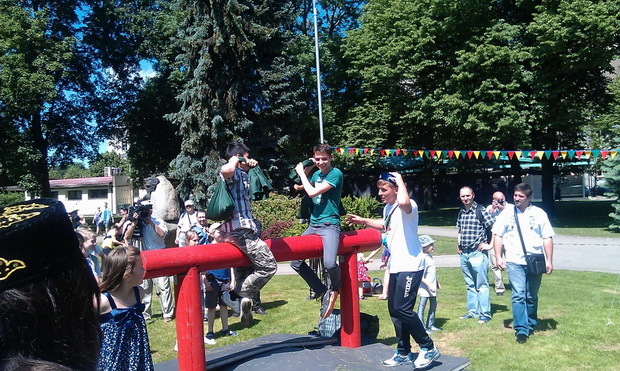 Sabantui folk festival in Riga was held earlier, however, Tatars from all over Europe for the first time have got together. An initiative of European Sabantui belongs to the branch of the World Congress of Tatars – Latvian Tatar-Bashkir society “Chishme” and association of Tatar youth of Europe. The offer to hold a holiday in Riga was supported by Mayor Nil Ushakov. Moreover, the event was included in the international program “Riga – European Capital of Culture 2014”.